Aluminum Grating is a versatile option for special grating applications where environments require unique consideration. Aluminum has light mass, a high strength-to-weight ratio, and high corrosion resistance, making it an ideal option for applications including food/beverage preparation, water vessels and sewage treatment facilities. It is available in Swaged, I-Bar, Press-Locked and Flush Top construction and in several bearing bar sizes. Most common bearing bar and cross rod spacing is 19-4 (1-3/16” and 4”, respectively). Bar Grating having a 1/2” maximum opening conforms with the Americans With Disabilities Act Guidelines (ADA) when installed with the elongated opening perpendicular to the dominant direction of travel. 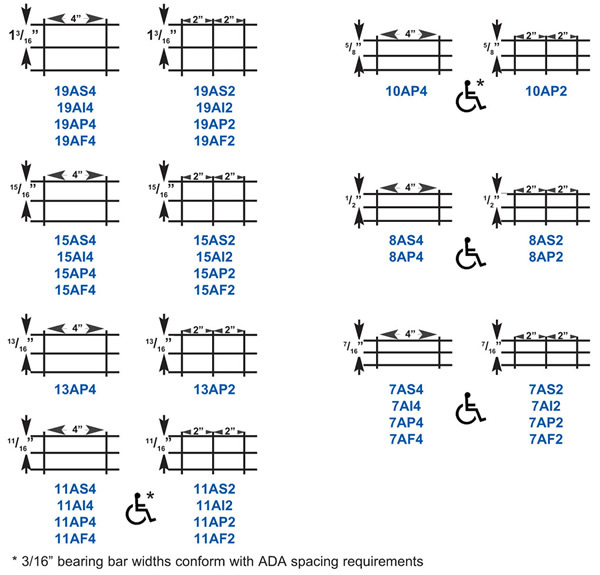 Brown-Campbell offers 11/16” and 5/8” in 3/16” width and 1/2” and 7/16” in 1/8” and 3/16” widths aluminum bar grating to meet your special ADA needs. In addition, Brown-Campbell offers Extruded Aluminum Grating Frames for embedded concrete applications. Please see Constructions for more information on the different aspects of Swaged, I-Bar, Press-Locked and Flush Top.